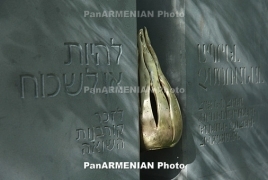 PanARMENIAN.Net - The activities of the Holocaust Memorial Day in Derby this year extended over 5 days from 28 January to 1 February and included a variety of commemorative and remembrance events and multi faith religious services. The commemoration service at the Chapel of St. Mary on the Bridge was memorable. It was an opportunity for remembrance and hope with readings from the Bible, the Qu’ran, and the Jewish Kaddish, accompanied by a roll call of genocides and music from the Cathedral Choir that also involved local school students. During this solemn reflection the poem by Paruyr Sevak, “We are Few, but we are called Armenians” was read in Armenian and in English, The Armenian Mirror Spectator reports.